Here is our selections of tea ware and accessories for brewing green tea. All tea ware items here are authentic "Made in Japan" and were designed especially for green tea. Included in this category are beautiful Japanese designed washi tea tins, tea spoons, ceramic water coolers (samashi), not to mention tea cups. Made in Tokoname Japan, this nice little teapot is perfect for brewing all types of green tea. A stainless steel mesh infuser screen is built into the side, allowing the tea leaves the necessary room to expand. Holds 9 ounces (270cc) of liquid. A high quality handcrafted teapot from Tokoname Japan, perfect for brewing green tea in every way. Unique to this design is the "swing" type of stainless steel infuser screen (see detailed images for a more accurate view.) The infuser screen is curved and is suspended off of the floor of the teapot, allowing the wet leaves to drain completely without remaining wet on the floor of the teapot in between subsequent infusions. Handcrafted in Tokoname, Aichi prefecture Japan, this Mogake style Yuzamashi watercooler was made with gyokuro and light steamed asamushi sencha brewing in mind. The watercooler was wrapped with seaweed, causing the salt from the seaweed to oxidize with the clay making a unique pattern on the teapot. Since gyokuro should be brewed at a lower temperature and with double the amount of loose leaf (usually the most expensive green teas available), the use of this special yuzamashi watercooler is ideal for gyokuro enthusiasts, allowing multiple infusions from the same gyokuro leaf. The set is intentionally made very small, holding just 135 ml of water. The lid fits the inside of the teapot wall perfectly. There is a very well made and thought out spout and the pour is smooth. This teapot is suitable for any gyokuro or light steamed green tea. You could probably use it with most medium-steamed green teas though you might get some clogging on the ceramic inner spout. Not suitable for deep steamed green tea as the fine, dust-like leaf particles. A high quality handcrafted teapot from Tokoname Japan, perfect for brewing green tea in every way. Unique to this design is the "swing" type of stainless steel infuser screen (see detailed images for a more accurate view.) Beautiful hand painted design on the outside. The infuser screen is curved and is suspended off of the floor of the teapot, allowing the wet leaves to drain completely without remaining wet on the floor of the teapot in between subsequent infusions. A very nice handcrafted teapot from Tokoname Japan. Perfect for brewing single cups of green tea, this teapot was designed for general green tea brewing. Built-in stainless steel infuser screen wraps 360 degrees around the inside of the spout. Very handy and sized for brewing a single cup or two of regular sencha. This teapot ca be used for fukamushi green tea or gyokuro as well. However due to the small leaf particle size of fukamushi-cha, small particles of leaf might occasionally become embedded in the infusor screen. If you are primarily a deep steamed green tea lover, a teapot dedicated to those would probably be more suitable. A very nice handcrafted teapot from Tokoname Japan. While perfect for brewing multiple or single cups of green tea, this teapot was designed for deep steamed green tea (fukamushi-cha) but is suitable for all green teas including gyokuro. Due to the fine, sometimes dust-like nature of fukamushi leaf, small bits of leaf can often get stuck in the stainless steel mesh of many teapots. Unique to this design is the built-in stainless steel infuser screen which covers just a small area of the inside part of the spout. This 48 prong matcha whisk is handmade in Japan especially for thick style koicha matcha. Not to be confused with imports from China, this authentic hand-made tea whisk is made in Nara Prefecture. There are over 120 different types of Nara tea whisks, with the type of material, shape and number of splines varying according to the school of tea, and also on the kind of matcha to be used. Note: This while you could use this whisk for other types of matcha, it was designed for use with thick "koicha" matcha. For general matcha brewing, we recommend this tea whisk instead. About our Tea whisk suppler (see photos) - Sabun Kubo was born in 1940 and started making tea whisks in 1964. He is an artisan very keen on protecting traditional crafts. A very nice handcrafted teapot from Tokoname Japan. One of our more popular items, it is medium sized teapot for brewing either single or multiple cups of green tea. Note: Do NOT clean teapot or infuser screen in dishwasher! 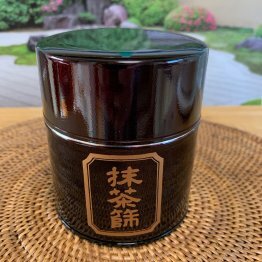 Handcrafted in Tokoname, Aichi prefecture Japan, this Mogake style yunomi teacup was made with gyokuro and light steamed asamushi sencha brewing in mind. The Japanese cermamic teacup was wrapped with seaweed, causing the salt from the seaweed to oxidize with the clay making a unique pattern on the teapot. This cup matches our Mogake shiboridashi, Mogake Hōhin, and Mogake yuzamashi water cooler perfectly. The cup is intentionally made very small, holding just about 40 ml of water, perfect for sipping perfectly made expensive gyokuro. Consisting of 65-72 prongs, this whisk is handmade in Nara, Japan and should not to be confused with imports from China that you will commonly encounter from most tea shops. There are over 120 different types of Nara tea whisks that vary according to the type of material used, shape and number of splines which will vary according to the school of tea, the kind of matcha (thick or regular thin type) which will be served, and various other factors. We chose this particular chasen for general purpose matcha drinking. About our bamboo tea whisk suppler (view detailed images) - Sabun Kubo Born 1940 and started making tea whisks in 1964. He is an artisan very keen on protecting traditional crafts. Differences between Japanese and Chinese tea whisks... The vast majority of tea whisks encountered on the market are copies made in China, not Japan. There is almost no market for matcha whisks within China itself, nearly all are exported abroad and surprisingly, even to Japan. Japanese craftsmen start the whisk making process using a sharp knife to chip the end of the bamboo, giving it a clean sharp break, whereas in China it tends to be done with a file. Because of this, the tip of the whisk prongs of Japanese whisks are known to last longer. The bamboo used in Japanese whisks is superior and is dried for well over a year before use, no fungacides are used when producing Nara tea whisks. A real Japanese whisk will cost 2 or 3 times more than a Chinese whisk, naturally. It certainly is possible to make matcha with a Chinese made whisk but for long term reliability, we recommend that you invest in the real deal. Backward sloping bottom. This effectively separates water from the wet leaves between infusions! Large, round, extra-fine stainless steel infuser removeable infuser screen. Does an especially good job of filtering the characteristically fine leaf particles of deep steamed green tea. Inner rim lip extrudes into the teapot, preventing dripping from the rim when teapot is tipped to an extreme angle. Square handle for an easier grip! Rubber tip on the spout - easier to pour with less mess! If you are looking for just one type of Japanese teapot that will brew just about any type of green tea, this item would make a very good choice. The potter of the Kyoto Matcha Bowl Mishimabori, Kazuhiro Arima, spent many years of his life studying ceramics in Kyoto, Kyushu near Nagasaki, and also studied in Ishikawa. This beautiful hand-made teabowl has an interesting pattern inside and is the perfect shape and size for matcha. It is made from a rather unusual red-rust colored clay and is handmade especially for O-Cha.com by a master Japanese ceramic craftsman - you will find this tea bowl no where else. Note that since this is a handcrafted item, the matcha bowl you receive may vary slightly from the photographs. Made in the Mino area near of Gifu Prefecture, this beautiful handmade chawan is the perfect tea bowl for brewing matcha green tea. This Tokoname water cooler, made from brown clay, the tea ware will come in very handy when making either matcha, sencha, or really any type of green tea. Since most green teas needs to be brewed at lower temperatures, use this item to cool your just boiled water to exactly where you need it to be. This water cooler has a very beautiful pattern on the bottom. Although it might not be an absolutely necessary accessory - the use of this nice wooden matcha bowl coaster with your favorite chawan could very well enhance the whole green tea experience! There is a small wooden vertical peg to place your tea whisk on as well. As with all of our products, made in Japan! Arita-yaki Sakura Chawan made in the famous Japanese ceramics making region of Arita. This beautiful handmade chawan is the perfect tea bowl for brewing matcha green tea. A beautiful handcrafted Kyoto Chawan. The potter of this item, Kazuhiro Arima, spent many years of his life studying ceramics in Kyoto, Kyushu near Nagasaki, and also spend years in Ishikawa. This beautiful hand-made tea bowl is simple, yet elegant in design. Made of a light orange-pink clay it is the perfect shape and size for matcha. This item is handmade especially for O-Cha.com by a master Japanese ceramics craftsman - you will find this tea bowl no where else. As each matcha bowl is handcrafted, there will naturally be slight variations between each individual tea bowl. The current version (shown on green table cloth) is similar to past versions (shown on red table cloth) but the gray is a bit darker and more pronounced. For a closeup, click on image and hover over the photo once it loads. From Mino Japan, an area famous for Japanese ceramics, this beautiful black matcha chawan is the perfect tea bowl for brewing matcha. The black color of the bowl enhances and contrasts with the green color of the matcha beautifully. Made in the Mino area near of Gifu Prefecture, this beautiful handmade shino chawan is the perfect tea bowl for brewing matcha green tea. A nice, dark matcha bowl provides a stark contrast with the beautiful green color of your freshly made matcha. Handmade in the Mino area near of Gifu Prefecture, this Mino-yaki chawan is the perfect tea bowl for brewing matcha green tea. This three color Shino matcha bowl is made in the Mino area ("Mino-yaki") near of Gifu Prefecture. Handmade, it is the perfect chawan for brewing matcha green tea. Roughly translates into "hanging cherry blossom branch", Shino Chawan "Edatare Sakura" is made in the Mino area near of Gifu Prefecture ("Mino-yaki"), this beautiful handmade chawan is the perfect tea bowl for brewing matcha green tea. Made in Tokoname, Japan, this water cooler, made from red clay, will come in very handy when brewing green tea. Since most green teas needs to be brewed at lower temperatures, use this item to aid you in cooling your just boiled water first to exactly where you need it to be. This Tokoname water cooler, made from green clay, will come in very handy. Since most green teas needs to be brewed at lower temperatures, use this item to cool your just boiled water to exactly where you need it to be. One of those things you can live without, until you try it! Matcha aficionados - Here is a handy item! Known in Japanese as a "matcha furui", use this sifter when brewing matcha. Simply add your matcha and work it through the built-in removeable fine mesh insert inside the canister. Removes clumps, makes for a smoother, frothier bowl of matcha. Available in dark burgundy or green, measures 73mm W x 79 mm H (2.9 inches by 3.1 inches) Quality craftsmanship throughout. Note: Product includes the the tool only, matcha purchased separately. A very beautiful porcelain hand-made teacup made in Arita, this Japanese ceramic cup is perfect for green tea. Will keep your green tea warmer longer if you are not quite ready to drink it right away. Measures 8.8 cm wide x 5.8 cm high (3.5 inches wide x 2.3 inches tall), holds about 220 ml to the rim. Arita-yaki Teacup "Shirogeshō Fukusencha" - Though not a huge teacup by any means, it is rather larger than your average Japanese teacup and copliments the green color of your green tea nicely. Hand-made in Arita Japan (known as "Arita-yaki"). Perfect for a large cup of Japanese green tea. Measures 10.5 cm wide x 6.5 cm high (4 inches wide x 2.6 inches tall). Arita-yaki Teacup "Kohiki Budō" hand-made teacup made in Arita Japan (Arita-yaki), this beautiful Japanese ceramic cup is perfect for green tea. Measures 7.8 cm wide x 5.7 cm high (3.0 inches wide x 2.25 inches tall). A very simple, yet elegante hand-made teacup. Made in Arita Japan out of white kaolin clay, the pure white color of this Japanese ceramic cup will help you evaluate any green tea's inherent color and to compare it against other green teas. The teacup itself is rather small, but it is exactly this kind of teacup that one often encounters in tea shops throught Japan. Measures 7.4 cm wide x 4.2 cm high (2.9 inches wide x 1.65 inches tall). Holds about close to 70 ml (2.4 oz) when filled to the rim.